You are bidding on 5 Spring Clips. These items can be used in square or round tubes that are put together in a telescopic design. These items are made of Manganese Silicon Spring Steel, which will resist stretching or losing its spring following rigorous use. 4/4.5/5/6/6.3//8/9 MM single pin buttons. 4/6/8/9 MM single pin (solid) buttons. 4.5/5/6//6.3/8/9 MM double pin buttons. 6/8 MM double pin (solid) buttons. worked great! glad to have my SUP paddle working again as it should! Descent quality and strong spring steel! Rugged! Good quality and a fair price! I went with the 8mm solid for doggie wheelchairs I manufacture and have no complaints at all. 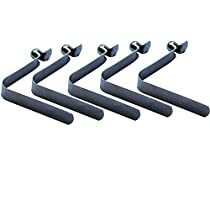 The quality of the spring steel is great and this will take large amounts of pressure and will not fail. Price is a little high but you get what you pay for. Pretty good quality. I use mine for paddles in salt water so they probably won't last too long, but you get 5 of them, so that should last a few years.